Breckenridge has 5 huge peaks spanning 2,907 acres to deliver an outstanding experience to every skier regardless of your ability. Trails are groomed nightly, ride the highest chairlift, the Imperial Express to the high Alpine bowels and take in Nature’s majesty. Breck offers terrain parks, 4 of them to be exact – one for every skill level. With its base sitting at 10,000ft, it’s also one of the best spots for spring skiing too. The Apres Ski scene offers warm welcomes with cozy fireplaces. Enjoy the local craft beers or my new favorite – a hot Toddy. 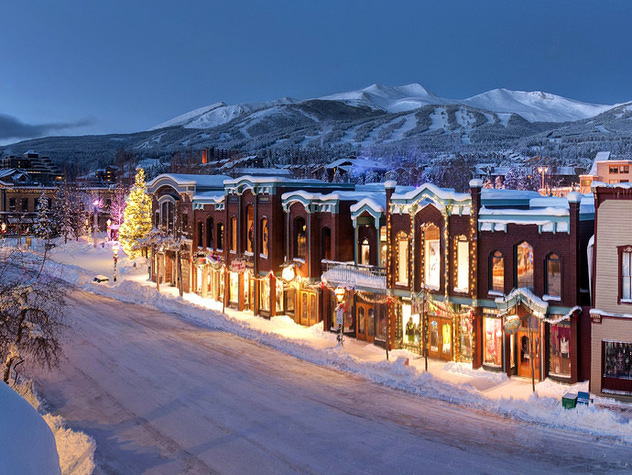 Breck has 96 bars and restaurants to tempt your taste buds. The good thing about Breckenridge is there are always a view and sunshine at nearly every restaurant and bar on the mountain and in town. What was that? Tell you more? OK! LSS will be staying at Beaver Run Resort and Conference Center, conveniently located at the Base of Peak 9 (Hint: Ski in / Ski out!). The resort is a 3 block walk to Main Street or you can pamper yourself at their onsite, luxurious Breckenridge spa. The rooms are hotel style rooms with 2 people per room. Airfare is being offered, please see below. Ground transportation will also be included. Standard Packages (including air, lodging, RT ground transportation and TSC/LSS fees) and Basic Packages (same as Standard without the air and optional ground) are available. Have questions? Please contact Paula Lanigan, the Breckenridge Trip Director at paula.k.lanigan@gmail.com.